When we left our heroes (and villains) in issue #1, their battle had spilled through a highly convenient shimmering desert portal, and they were in the process of coming to terms with the altogether new threat of a land full of dinosaurs. As the scenes of pursuit unfold, Connors’ men are are picked off one by one by roaming Velociraptors and a Tyrannosaurus Rex, quite indifferent to their personal struggle. Chewed up and bitten in half, it becomes more and more apparent that Andar and Turok are the only two men with the calm and intuition to deal with an onslaught of giant lizards. In a cloud of Yankee blood, the Captain strikes a deal – get out together, as a team, and then “we’ll see”. 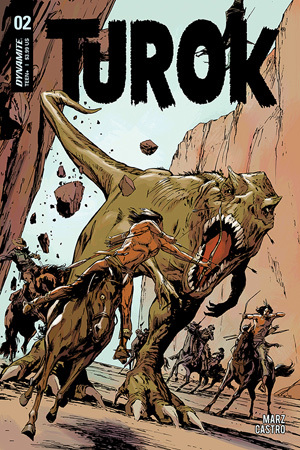 Turok accepts, and they make plans to get moving. But just as the newly forged alliance start making progress, the team find themselves in a situation that neither guns nor arrows can save them from. With seemingly no option but to surrender to gargantuan reptilian jaws and the new threat of Neanderthal warriors, they are rescued at the final hour by DUN DUN DUN… I don’t want to be accused of spoiling it for you, so I’m not going to.